Many caterers are including a food truck as part of their operation. Is it time for you to hop on? Many people credit the birth of the modern, chef-driven food truck to Thanksgiving 2008, when Los Angeles-based chef Dave Choi began selling $2 Korean barbecue tacos from his Kogi BBQ Taco Truck. But mobile food has a much longer history in America. Predating Choi by 136 years is Walter Scott, an innovative chap from Providence, Rhode Island, who, while running a street stand selling newspapers, fruit, and candy, happened upon the brilliant idea of launching a mobile food service, selling meals directly from a horse-drawn wagon he parked in front of the Providence Journal office. While many who run diners claim Scott as one of their own, the food truck movement ought to erect a statue to the enterprising guy—although, by rights, it should be a statue on wheels. Food trucks have gained in volume, variety, and popularity, and there are now more than 4,000 of them on the streets of the U.S., generating $1.2 billion in annual sales, according to Mobile Cuisine magazine. The typical business trajectory is food truck-to-restaurant, as many chefs find the cost of starting a business with a truck less onerous than what’s required to launch a freestanding restaurant. But some caterers also are getting on the food truck—pardon the pun—bandwagon. They’re finding a truck can be an effective mixture of “mobile business card,” freestanding revenue generator, and new-style serving method for trend-savvy clients. Still, the road traveled by the modern food truck can occasionally be a bumpy one. Learn from these three caterers about their successes, surprises—and what they’d do differently if they were taking that first test drive today. With a goal to make indigenous foods more accessible to as many communities as possible, Minneapolis, MN-based The Sioux Chef, founded by chef Sean Sherman and co-owner Dana Thompson, began with a strongly educational focus. Catering, Thompson says, was one delicious means to an educational end: “It allowed us to reach out to many different types of people to tell our story about these enjoyable foods that are naturally gluten-, dairy- and sugar-free,” she explains. 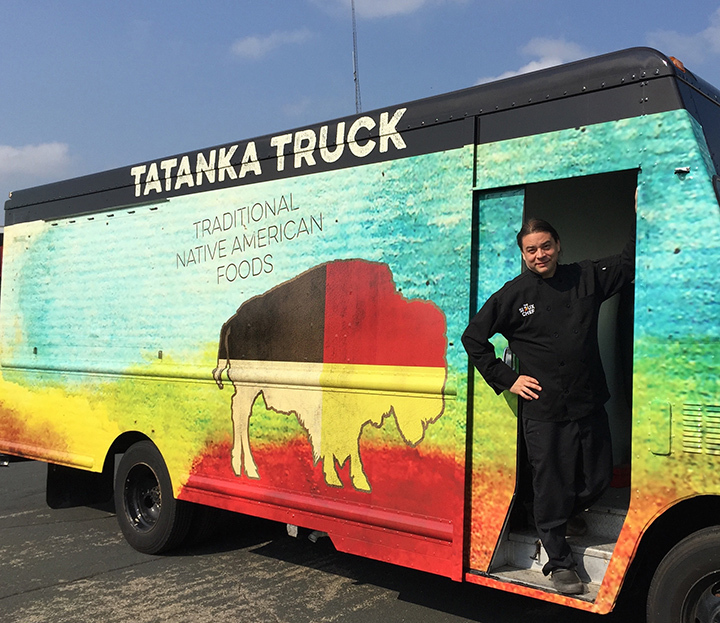 Their catering business was up and running when The Little Earth Community of United Tribes approached them about starting a food truck, which they named Tatanka (the Lakota word for bison). It serves everything from indigenous tacos to winter wild rice bowls and features ingredients such as wild greens, bison, Red Lake walleye and smoked turkey. From the beginning, they knew they didn’t want to join the downtown Minneapolis lineup of lunchtime trucks. “We’re most likely to be at tribal gatherings, pow wows, and cultural events,” she says. “We love the idea of anyone being able to spend 10 dollars and try indigenous foods.” They’ve also partnered with various Twin Cities’ taprooms, which are not allowed to serve food, and have found a home at St. Paul, MN’s Burning Brothers gluten-free brewery. Omaha, NE-based caterer Attitude on Food has made a name handling Fortune 500 clients and major civic events like the U.S. Triathlon, which attracted 10,000 athletes. 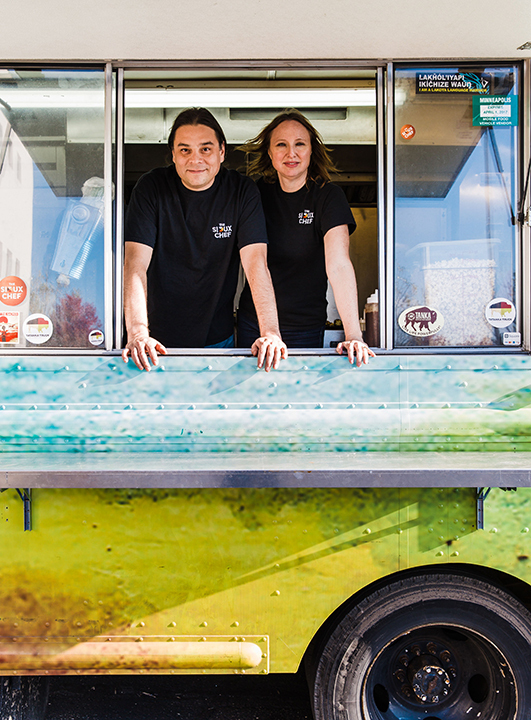 Co-owner and director of sales Melissa Tibben says that purchasing a food truck had been a backburner idea for a while, but the final purchase was made almost on a whim. “Nathan Newhouse, our co-owner, told me, ‘Hey, Melissa, there’s a bread truck for sale—grab your purse and we’ll go look at it.’” Within a week, the truck had been purchased and was being fitted to their specifications. 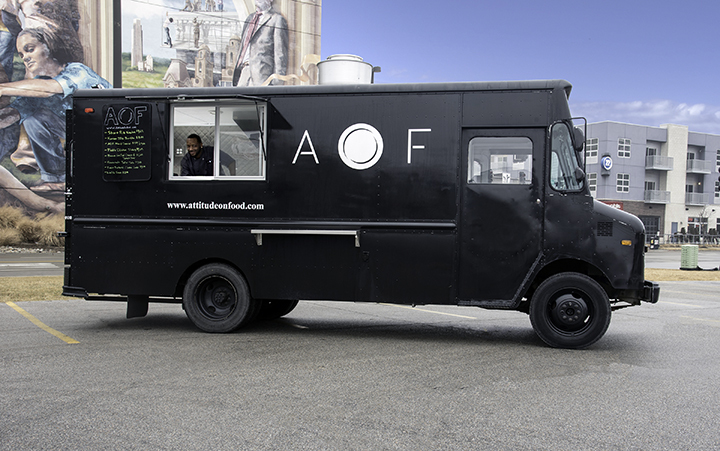 While the AOF truck has been successful both as a freestanding unit and as a complement to catered events, Tibben says they experienced what just might be the worst launch in food truck history. “We’d tweeted all about our big opening day, but on the way to the venue, the truck ran over a nail, and one of the brand-new tires went flat,” she shares. “We were desperate to get there, but we quickly learned that new food truck tires are not easy to come by. We decided to poke fun at our predicament in social media, and people were super-supportive.” These days, the truck is fully booked during the mild-weather season. “We have to turn people down all the time,” Tibben says. The food truck is often a highlight of Crave’s catered events, whether as a late-night snack option or the centerpiece food service option. 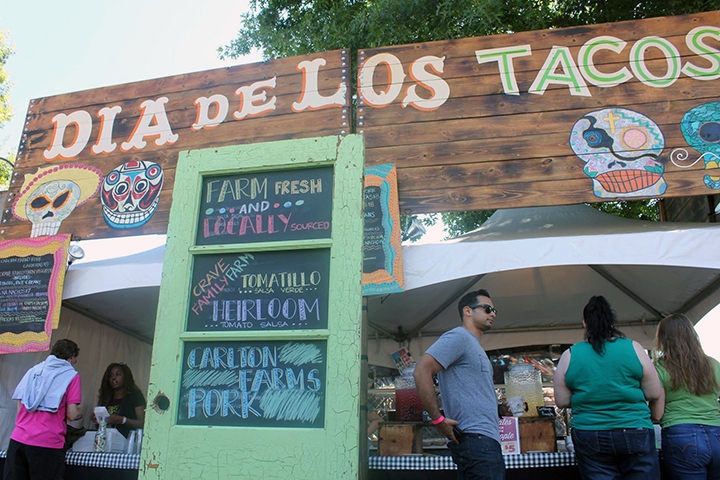 Lopez has created “Dio De Los Tacos” signage and takes the trucks to outdoor events, as well.